Holy basil is an exceptional tonic and adaptogenic herb. It can help you focus and increase your concentration. It can be mixed with other herbs in cooking or with other teas like green tea. As an infusion for tea, chai latte or as a tincture, it is very pleasant tasting. The scientific name is Ocimum tenuiflorum or Ocimum sanctum. 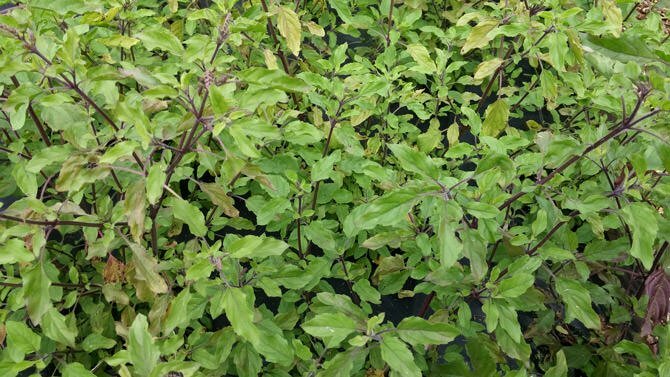 THe most common name is Holy Basil, but also Tulasi (sometimes spelled Thulasi) or Tulsi. Other names include Ajaka, Albahaca Santa, Bai Gkaprow, Baranda, Basilic Indien, Basilic Sacré, Basilic Sacré Pourpre, Basilic Saint, Brinda, Green Holy Basil, Hot Basil, Indian Basil, Kala Tulsi, Kemangen, Krishna Tulasi, Krishna Tulsi, Manjari, Ocimum sanctum, Ocimum tenuiflorum, Parnasa, Patrapuspha, Rama Tulsi, Red Holy Basil, Sacred Basil, Sacred Purple Basil, Shyama Tulsi, Sri Tulasi, Suvasa Tulasi, Tulsi Patra. The above is the purple variety, compared to the first image with the greener variety. The stem is purple and some leaves turn people as well. Looking at the DNA of various biogeographical isolates, the origin of Holy Basil is North Central India. The name Tusli/Tulasi comes from the Sanskrit Surasa, meaning the incomparable one. Tulsi is a sacred plant to the Hindu. The leaves play an important part if the worship of Vishnu, Krishan and Rama. Holy basil is native to India and has spread to other parts of Asia. It's also found in Australia, West Africa and the Middle East. It was never introduced to North America, but can be found in Puerto Rico. This doesn't meant you can't grow it yourself in North America thoughj, as many people do. In India it's used for religious and traditional Ayurvedic medicinal purposes. In Thailand, it's called Thai holy basil and used in Thai cuisine. 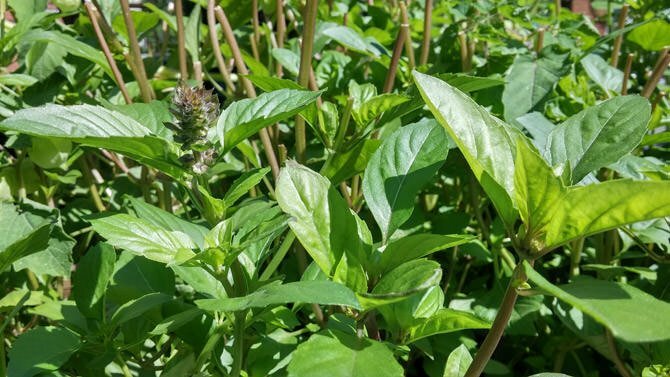 It's different from Thai basil which has smaller leaves. In Ayurvedic medicine it's an adaptogen to counter stress and anxiety. Medicine is made from the leaves, stem and seeds. It's thought to decrease inflammation as well. As a herb spice in foods, it's used in stir fries and spicy soups due to the peppery taste. Not really, but if you're trying to become pregnant, animals studies have shown taking it orally has reduced the the chance of a fertilized egg attaching to the uterus. Those breast feeding may also choose to avoid it, but it's not known to be a danger. It might also lower blood sugar levels, so those with type 2 diabetes might need to adjust insulin or antidiabetic drug use. Holy basil might also lower thyroxine levels and be an issue for those with hypothyroidism.